1. Preheat oven to 350°F. Line 12 regular-size muffin cups with paper liners; spray liners with cooking spray. Set aside. 2. Make twelve 3/4-inch balls of cookie dough; place on ungreased cookie sheet. Bake 5 to 6 minutes or until golden brown. Cool completely. Set aside to decorate the top of cupcakes. 3. Shape remaining cookie dough into 12 (1-inch) balls. Set aside. 4. Meanwhile, place the flour, cocoa powder, baking soda, xanthan gum, salt, sugar, oil and water in bowl of electric mixer fitted with paddle attachment. Mix on medium speed 1 to 2 minutes or until blended. 5. Spoon slightly less than 2 tablespoons batter into each lined muffin cup, about half full. 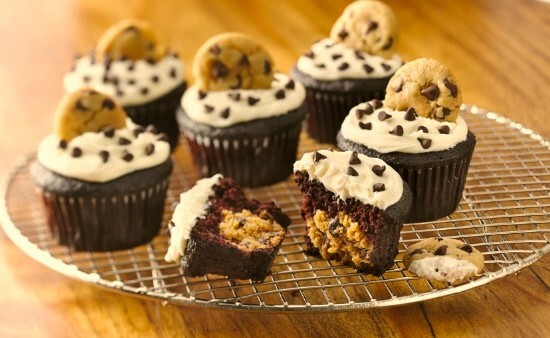 Place 1 cookie dough ball in center of cupcake batter in each muffin cup. Cover balls with another spoon of batter, about three-fourths full. 6. Bake 28 to 30 minutes or until toothpick inserted in center of cupcake comes out clean. Cool about 30 minutes. 7. Frost cupcakes with cream cheese frosting. Top each with mini cookie from step 2, and sprinkle with mini chocolate chips. Preparation time: 30 minutes. Baking time: 35 minutes. Cooling time: 30 minutes. Cat Cora made television history as the first female Iron Chef on Food Network’s Iron Chef America, and most recently became the first woman to be inducted into the American Academy of Chefs® Culinary Hall of Fame. She is an accomplished author, restaurateur with six dining establishments, avid philanthropist and television host. Cora has authored three successful cookbooks, and one children’s book. She has appeared in a number of hit TV food shows, including Food Network’s Melting Pot; Kitchen Accomplished; NBC’s Celebrity Cooking Showdown; and Bravo’s Around the World in 80 Plates. In 2004, she founded Chefs for Humanity, a non-profit organization dedicated to reducing hunger worldwide by supporting humanitarian relief and promoting nutrition education. Cora grew up in an intimate Greek community in Jackson, MS, where she developed a passion for the culinary arts while watching her family infuse Southern spices with Mediterranean delicacies. She resides in Santa Barbara, CA, with her wife and four sons.